'Hello, sweetie!' Melody Pond, Melody Malone, River Song...She has had many names. Whoever she really is, this archaeologist and time traveller has had more adventures (and got into more trouble) than most people in the universe. And she's written a lot of it down. Well, when you're married to a Time Lord (or possibly not), you have to keep track of what you did and when. Especially as it may not actually have happened to both of you yet. These are just a few of River Song's exploits, extracted from her journals. Sometimes, she is with the Doctor. Sometimes she's on her own. But wherever and whenever she may be, she is never far from danger and excitement. This is just a tiny portion of her impossible life. 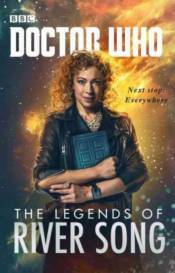 But it will reveal more than you've ever known about the legend that is River Song.